We’ve taken our two leading edge products and created an unparalleled flooring solution! Gone are the days of having to choose between comfort and customization. Introducing a modular tile that takes flexibility, performance and safety to the max - ErgoDeck® MAX. 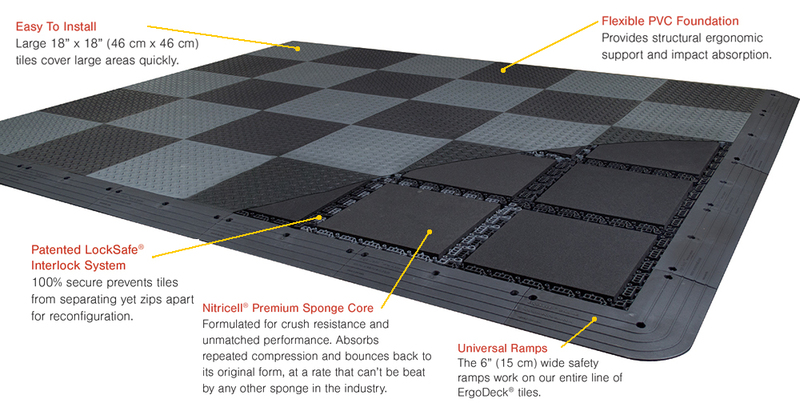 We joined together our innovative ErgoDeck® modular tiles and our proprietary Nitricell® premium sponge, to create a modular floor tile system that provides superior rebound for your Industrial Athletes. The Reviews Are In! And They're Spectacular! “From the moment I stepped on ErgoDeck MAX I’ve been impressed. It has the ergonomic feel of 414 and the durability, modularity and flexibility of Ergodeck.